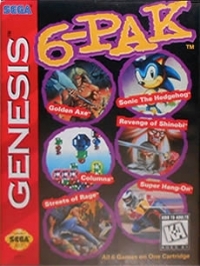 Box Text: Grab the 6-pack that'll quench your thirst for gaming! SONIC THE HEDGEHOG: This is it! The original that started it all! GOLDEN AXE: Ride a flame-spitting monster to victory! Three characters, each with special magic and weapons, battle to save the kingdom! COLUMNS: The brilliant puzzle game that will challenge your mind, not just your trigger finger! SUPER HANG-ON: Red-line your bike and blow away the competition! There's no better thrill than the roar of your pipes as you leave another rider behind, except maybe customizing your bike into an unbeatable racing machine! REVENGE OF SHINOBI: Use deadly ninja attacks to defeat the evil Neo Zeed army! If you fail, their beautiful prisoner dies! STREETS OF RAGE: The ultimate in street combat! Three characters, 40 moves, and a relentless onslaught of weapon-wielding thugs! 10-13-2012 exonerator Box Text Grab the 6-pack that'll quench your thirst for gaming! SONIC THE HEDGEHOG: This is it! The original that started it all! GOLDEN AXE: Ride a flame-spitting monster to victory! Three characters, each with special magic and weapons, battle to save the kingdom! COLUMNS: The brilliant puzzle game that will challenge your mind, not just your trigger finger! SUPER HANG-ON: Red-line your bike and blow away the competition! There's no better thrill than the roar of your pipes as you leave another rider behind, except maybe customizing your bike into an unbeatable racing machine! REVENGE OF SHINOBI: Use deadly ninja attacks to defeat the evil Neo Zeed army! If you fail, their beautiful prisoner dies! STREETS OF RAGE: The ultimate in street combat! Three characters, 40 moves, and a relentless onslaught of weapon-wielding thugs! 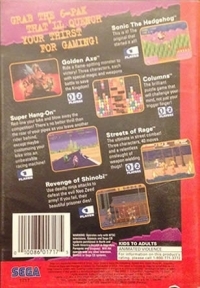 This is a list of VGCollect users who have 6-Pak in their Collection. This is a list of VGCollect users who have 6-Pak in their Sell List. This is a list of VGCollect users who have 6-Pak in their Wish List.